Researchers from Binghamton University, State University of New York may have discovered the future of healthy skin. An anionic surfactant known as sodium lauryl sulfate (SLS) - an ingredient often found in cosmetic cleaners - may play a role in protecting our skin from chemicals and the effects of the environment. Skin acts as the first line of defense to the outside world and the wettability plays an important role in contact inhibition of microorganisms, says Guy German, an assistant professor of biomedical engineering. We can alter the wettability of the human skin. The teams of researchers are led to believe that their discovery could not only have a big impact of controlling microorganisms finding their way into our skin, but also have an influence of our sensory area. Also known as C12H25SO4Na, SLS can be frequently found in numerous hygienic, cosmetic, and cleaning products. The material is mostly used to remove everyday residue and stains. However, German and his team of researchers seem to have cracked the code to explore the changes in the mechanics and functionality of healthy skin tissue. Basically, the wettability of the top layer of our skin can be controlled by continuous treatment of C12H25SO4Na at various pH levels. Then, the surfactants, which are amphiphilic chemicals, are able to both attract and repeal water simultaneously. In harmful environments, your skin will be able to have both a positive and negative charge that can repel water as necessary. In other environments with high alkaline, the process will attract more water. We can change the surface wettability of skin, its quite neat, says German. We can actually flip these little molecules upside down. German and his team continue to utilize their resources to explore the various fluctuations this ingredient has to treat disordered skin from natural processes such as aging and infections. While we continue to use this common ingredient in our homes and sometimes use them to alter the wettability of hair, it seems that its potential extends onto our skin. This would mark the first time that anyone has been able to alter any kind of bacterial growth on the human skin. The next step of this discovery would be to translate the results of Germans research to everyday use. The hope of this innovative sulfate discovery is to exploit the results that have the potential to help improve drug delivery, deter bacterial growth on human skin, and even progress biointegrated electronics and sensor systems. 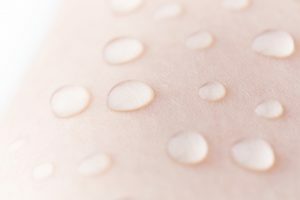 If you think about what that could be good for, well, if you say you had an environment where you didnt want droplets of water in contact with your skin, we are able to make your skin hydrophobic, which means the water wouldnt spread itself, says German. This discovery means that we could potentially control the water coming into contact on our skin and avoid it at all costs. On the other hand, for those who use cosmetic products on an everyday basis, and may or may not have trouble with its usage, because of Germans discovery, you could allow the product to become hydrophilic to enhance spreading. German and his team hope to put their discovery to practical use in the near future. Who knows, maybe the material could extend its use onto our leather shoes. It would be nice if they were hydrophobic on those cold, rainy days.